Alex's Motorcycle Adventure Alaska, Mexico, Central + South America! Modern Motorcycle Diaries: Bogota Colombia, Motorcycle towing, Home for the Holidays! Bogota Colombia, Motorcycle towing, Home for the Holidays! So after a nice vacation I"m back to typing and sharing the adventure again, it was nice to have some time off. Keep updated on the page because there's lots to come! 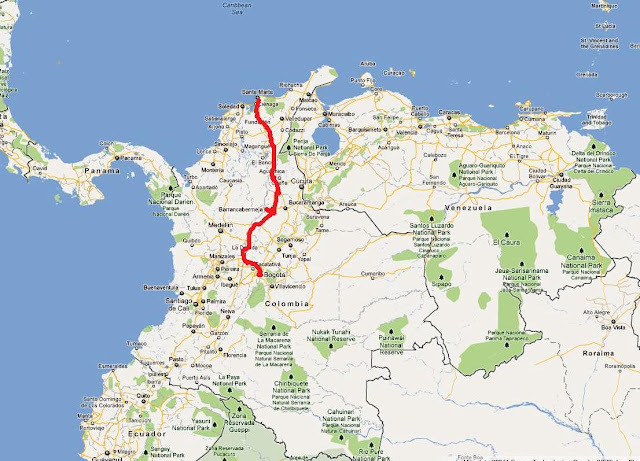 So last we left off we were on our way to Bogota from Northern Colombia. As we were in close proximity to the Venezuelen border we saw the sale of cheap gasoline on the street. People typically cross to Venezuela for the 7 cent a gallon of gas and bring it to Colombia to sell at $4 a gallon. Had a nice crowd again looking at me strangely. After David’s nice hospital visit, we were faced with yet another issue. My motorcycle’s carburetor kept flooding, meaning that every time we wanted to start the bike, David would have to pull me, and I would have to pop the clutch to jump start the bike. The carburetor would then flood at stop signs or lights, so along with towing the bike for many miles I also had to run lots of stop lights and signs as carefully as possible. We finally made it to a decent town with a mechanic. We had to take apart the entire motorcycle to figure out the problem. Once we thought we fixed it we put it back together, only to find out that the fix didn’t work! So this went on the entire day and had to spend the night. Here’s a neat video of the process it is to take apart and put back together the bike. We finally patched up the bike for the last 300 miles it would take to get to Bogota. I will say I don’t know how we made it to the Kawasaki dealership in Bogota, but I will say that as soon as I stopped the motorcycle it died on the front parking lot at the dealership, what luck! We dropped off the bikes and went exploring. As it approaches Christmas time David and I agreed to go home and visit the family for a few weeks, then come back and finish the adventure. I didn’t tell my family I was going so it was a surprise. I spend my last few days in Bogota designing and buying more business cards than I know what to do with. Visited my favorite motorcycle alley to buy some custom made stickers that say "ExpeditionSouth"
This area will also give you access to any stolen and makeshift motorcycle goods you can think of ! I also ate some amazing pizza! Went christmas shopping on the streets of Bogota with all the other people, it was ridiculous! A $2 hair cut, with a very nice and gay guy who decided to fondle my hair in a very gay and weird manner. And every day I got my $1 cup of exotic fruit. Along with my 50 cent peanut and chocolate treat. This made me happy as I used my beautiful laptop I broke a few months ago riding through the rough roads of Bolivia! SO David and I will be back home for the Christmas holidays, we know our families will be happy to see us. Personally I'm looking forward to relaxing and doing nothing. A well deserved break after being on the road for over a year!